In a televised statement on October 8 Ethiopian Prime Minister Hailemariam Desalegn declared a state of emergency, the first in the ruling Ethiopian People’s Revolutionary Democratic Front, EPRDF’s, quarter a century rule. It was a last ditch effort to halt the sustained Oromo uprising which has intensified as it entered its 11th month. As it has done over the last two decades, the Tigrayan People’s Liberation Front (TPLF) dominated regime resorted to the federal constitution (Article 93) to intensify and legitimize its oppression. Ironically, EPRDF has utterly ignored and even trampled upon the same constitution for 25 long years when citizens exercised their right to freedom of expression (Art 29), peaceful assembly (Art 30), right to life (Art 15), prohibition of inhumane treatment (Art 18), freedom of religion (Art 29) and many other provisions. In practice, the Oromo and other oppressed nations in Ethiopia have been under a condition similar to state of emergency. The EPRDF regime has been killing, detaining and disappearing innocent civilians, often without any wrongdoing. Its many notorious prisons and torture chambers are filled with dissidents, journalists and protesters, whose only crime is often exercising their basic and constitutionally guaranteed rights. In an attempt to halt widespread resistance in Oromia, Amhara, Konso and Benishangul Gumuz regions, EPRDF has resorted to an alarming trend of state terrorism through violent crackdown and indiscriminate killings of unarmed civilians. Ethiopia already had a dismal human rights record. The government has systematically made independent reporting impossible through its tight grip on the media and civil society, including routine internet and social media blackouts. Calls for independent investigation by international human rights groups, including two formal requests by the United Nations High Commissioner for Human Rights has been ignored by the government. Ethiopian authorities continue to commit mass atrocities and blame the so-called “anti-peace forces,” including rebel groups mainly the Oromo Liberation Front (OLF) and Ginbot 7, its archenemy Eritrea and now Egypt for sponsoring the protests. The new decree allows the EPRDF regime to suspend basic rights and operate with total impunity. 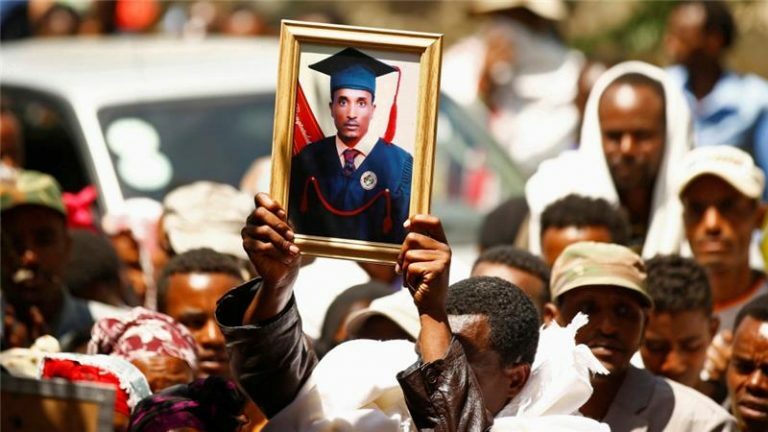 A closer look at some of the mass killings by Ethiopian security forces since the Oromo protests began in November 2015 shows a series of premeditated acts aimed at scaring into submission, constant subjugation and oppression. The protests took an unprecedented turn on August 6 when more than 200 towns across Oromia took to the streets opposing the Oromo people’s continued marginalization in Ethiopia. It was a culmination of months of sporadic protests across the region and it marked one of the most significant development in Oromo resistance against the incumbent regime. A few days later the Amhara people staged similar protests in Gondar and Bahir Dar cities, opposing the decades long incorporation of Walkayit region into the Tigray regional state. The protesters also expressed solidarity with their Oromo counterparts in the south of the country and demanded the government to stop its violent crackdown. This was a significant development for Oromo and Amhara politics, which has not always been cordial. It’s a turning point. Two of Ethiopia’s largest ethnic groups shunned a history of mistrust and EPRDF’s divide and rule tactics, which has for long pitted them against one another. Security forces fired live bullets on unarmed protesters killing dozens (Amnesty International put the death toll at 97) and injuring hundreds more across Oromia and Amhara regions. In early September, a mysterious fire at Qilinto prison left many inmates dead in government custody. Eyewitnesses reported gunshots as terrified inmates scrambled to escape the raging fire. This was followed by days of nightmare for the families of the prisoners at the 3,000-person remand center, including high profile Oromo political leaders and prisoners of conscience, as the government ignored pleas for (any) information about causality and the inmates wellbeing. A couple of days later local an unidentified prison guard told the Addis Standard magazine that regular prison guards were replaced by federal army the day before the fire broke out. While the fire was raging, the informant said he saw the new guards indiscriminately firing at prisoners trying to extinguish the fire. He also claimed seeing at least 18 dead victims carried out of the prison, all with gunshot wounds. The government has denied requests for independent investigation. The cause of the fire, exact number of casualties and causes of death remains mystery to date. On October 2, an estimated 2 million people from every corner of Oromia flocked to Lake Arsadi in Bishoftu to attend the annual Oromo Thanksgiving Day called Irreecha. In addition to its religious and cultural significance, in recent years, Irreecha has become the largest stage where the Oromo celebrate their identity, renew their unity and protest in unison against their economic, social and cultural marginalization by singing resistance songs. This year’s celebration was unique since it’s held after 11 months of killings, arrests and mass exile of hundreds of youth from the country. The Irreecha festival which is known for its spirit of peace, harmony and prosperity is not to be this year. It became another occasion for the merciless and calculated mass killings of the Oromo by the TPLF controlled government. There is a compelling evidence that indicate the stampede at Irreecha was a premeditated massacre intended to cause maximum harm to disseminate fear and stop the growing Oromo movement. This year’s Irreecha was widely expected to draw a huge opposition against the government as part of the Oromo protests. The heavy security presence at the site of the festival was meant to instill fear in the crowd. Helicopters flew overhead all morning. Federal and regional authorities knew about the existence of ditches but failed to protect the crowd as they have done in the years past. Before firing teargas and live bullets into the crowd, security forces deliberately blocked the main exits, leaving open only narrow exits near the trenches. It does not take an expert to predict what would happen in this situation in a small, confined space crowded by millions of people. The firing of teargas and live bullets was clearly meant to cause panic and a stampede by forcing the crowd to flee in the direction of deep ditches. For over 11 months the Oromo have been peacefully demanding change despite increasing violent responses from the Ethiopian government. The regime is clearly unwilling to resolve the protesters’ deep rooted grievances. By declaring a state of emergency, it is clear that the government intends to increase its violent crackdown by suspending even the symbolic political and democratic rights guaranteed under the constitution. The decree will last six months with a possible extension by four months, which will no doubt sail through the single party parliament. The Oromo nation’s quest for freedom and equality is not a scheme of “anti peace forces” or “foreign powers” as the government claims. It is a century old quest for self-determination. The ongoing Oromo movement is but a culmination of decades old struggle for peace and justice. Increasing violent crackdown and the tightening of an already narrow political space will only intensify the resistance and lead the country toward further turmoil.